At today’s official launch in London, the CEOs of the three airlines outlined the benefits of the transatlantic joint venture, including new routes, codeshare agreements on over 2,600 flights, and the rescheduling of key flights between London and JFK. 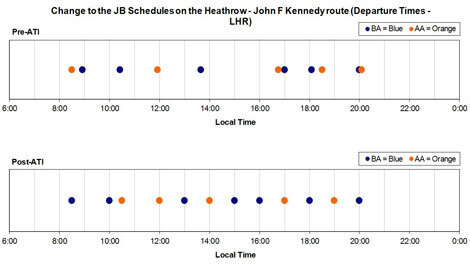 The joint business, which came into effect on October 1, sees BA placing its code on 2,063 AA and Iberia flights to 181 destinations, with AA adding its code on 322 BA and Iberia flights, and Iberia placing its code on 354 BA and AA routes. Members of all three frequent flyer schemes can now earn and redeem miles on eligible routes, and also have the ability to mix and match outbound and return fares from the carriers. For the first time BA and AA will also open their Arrivals lounges at Heathrow T3 and T5 to all Oneworld Emerald status cardholders landing on either airline’s flights. In his speech BA’s CEO Willie Walsh said that BA and AA schedules on the key routes including London-New York would be realigned to provide more choice. The graphic below illustrates this, with the granting of ATI (anti-trust immunity) enabling a more even spread of flights throughout the day. AA’s CEO Gerard Arpey said that the new schedules, which take effect for the summer 2011 season, would allow for “virtually an hourly service” between the two cities. Schedules between London and Chicago will be similarly adjusted. The three carriers also announced new routes which “would not be economically viable for a single airline”, namely London to San Diego with BA (the third time the carrier has attempted to make a go of this route), New York JFK to Budapest and Chicago to Helsinki (both operated by AA), and Madrid to LA with Iberia. The four new routes will start from next April. Walsh said that the joint venture “was not seeking to match the customer proposition across the three brands” and said that there would be “absolute clarity to passengers in terms of what they can expect from each carrier”. But he said that the agreement enabled benefits including “facilitating transfers [between the airlines] in a way that has never been done before”, as well as the alignment of policies such as baggage allowances, and “a committment that when you’re flying between us we will look after you as if we’re operating as a single entity”. He added that BA was “looking to see if we can move some flights between T5 and T3 to maximise the [joint venture] benefits to our customers”, but admitted that there was limited opportunity for this at Heathrow. At JFK however he said that they were looking at the possibility of greater co-location with AA. Walsh referred to the market for flights between Europe and the US as “the most competitive in the world”, with 40 airlines offering routes, and said that the agreement had created a new entity capable of providing greater competition with the other two alliances (Star Alliance and Skyteam) now operating across the atlantic with anti-trust immunity. For the full press release and factsheet from today’s launch, including more specific changes as a result of the joint venture, see our forum. Click on the embedded video below to see the speeches by the three CEOs.